Long ago the Hare and the Rooster were good friends. They often visited each other. One day the Hare visited the Rooster. Upon his arrival the Hare found that his friend had one leg. Meanwhile, the Rooster had hidden one of his leg inside his feathers. They had their normal chat until the hare went back to his home. 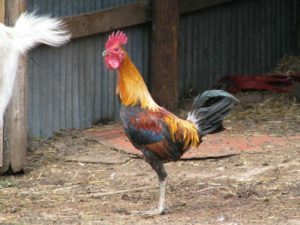 When he reached there, he immediately told his wife that his friend, Rooster had one leg . He asked his wife to get a knife and cut one of his legs. The wife to Hare refused, but after the Hare insisted, she indeed cut his one leg. On another day, the Hare visited again his friend Rooster. This time around he found him with one leg and without head. The rooster had hidden his leg and head in his feathers again. Although he had no head, they still had a normal chat. The Hare did not understand how something without head could talk, for this reason he also wanted to try to talk without head. After getting back home, the Hare called his wife again and explained to her what he had seen at his friend. He insisted to have his head cut too. His wife took a sharp knife and chopped off his head. The Hare died on the same spot.